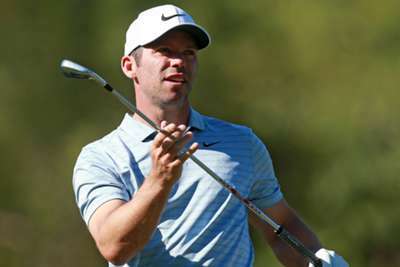 Defending champion Paul Casey moved into a share of the lead at the halfway mark of the Valspar Championship on Friday. Casey jumped 28 spots to take the lead at six under, alongside American Austin Cook. Englishman Casey used an eagle on the par-five fifth hole and four birdies to card a round of five-under 66. Cook powered his way to first place behind five birdies. But it is a congested leaderboard, with world number one Dustin Johnson just two strokes off the pace. Johnson finished the day with one of the more colourful scorecards. He opened his day with a double bogey and bogey on his front nine, but closed out his round with five birdies and a bogey on the back to finish with a two-under 69. Look at that ... look at that! Johnson sits in a three-way tie for sixth at four under with Curtis Luck and round-one leader Joel Dahmen. Between this trio and first place sits Luke Donald, Im Sung-jae and Scott Stallings in a tie for third. Donald has been battling injury and has only made three PGA Tour starts this season. He even took a share of the lead at one point with a long birdie putt. There is a sizable tie for ninth place at three under that has Jon Rahm in contention. Rahm made a birdie-bogey-birdie start before levelling out. He was mistake-free for most of the day with three more birdies until a bogey on the par-four 18th hole capped off his round. A number of golfers were close to not making the cut. Sergio Garcia, Henrik Stenson and Zach Johnson are just some of the names to inch by in a tie for 49th place at one over. Some notable names to not make the cut were Gary Woodland – who missed the weekend for the first time in his last 23 starts to snap a tour-best streak – Keegan Bradley, Charl Schwartzel and Jason Day.